I have been pretty blessed to have many wonderful friends in my life, I cherish my friendships with these special people. My best friends make me laugh, accept all of my silly antics, and my crazy schedule. They give me the scoop on good books, great movies, and the best shopping spots! For all of this I think my very best buddy deserves a ribbon to let her know how much I adore her, and appreciate all that she is to me! Have you seen the Upcycle collection from Cosmo Cricket yet? Its so fun and hip I love the handbag prints and the funky polka dots! For this card I chose to zero in on the yellows, grays and black print. 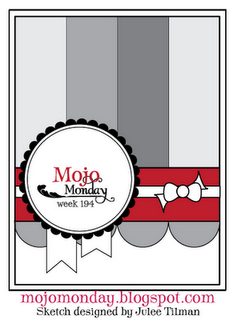 This weeks sketch over at Mojo Monday is probably one of the best yet, I really LOVE this gorgeous sketch by Julee Tilman is pure genius! I always print out the sketches and keep them in a binder so I can go back and use them over and over, this one is gonna' make it to the front with all of my other favorites! I used the built in shapes on my Cricut Imagine to build the ribbon, and cut the tails by hand. The center flower was coated in sugar glitter for a much needed bit of glitz! I just want to take a minute to thank all of you that sent me such nice emails and messages wishing me a safe trip to New York, it really means a lot to me that I have made so many new and genuine friends through this big ole' blog world. It makes me feel like "its a small world after all :) " Talk to you soon! This is so pretty! Totally loving the way you glittered the edge on the medallion!! Great job with the awesome sketch!! I love to use glitter! This is AWESOME! Love the gray and yellow combo! Great job with the mojo sketch, too! Oh, this is fabulous! Love the layering, the glitziness and the fab colors. Thanks for playing Mojo Monday!